Now at home at Senmila Farm, rescued pony Lenny (right) and his new friend Kimi (left) enjoy daily visits and plenty of carrots from the Jessie Mazzoni and her older daughter, Senna (center). Just as digital advertising executive Jeanne Martin was getting ready to head into a big pitch meeting with her CEO, she came across a post on her Facebook feed from a site called Auction Horses. It was a photo of a pony standing in a Texas kill pen, only an hour away from being loaded onto a truck bound for a slaughterhouse in Mexico. Martin lives in Washington, D.C., and she knew she wouldn’t be able to board both “Lenny” and her own horse at her trainer’s farm in Maryland, so she shared the post on her wall asking for someone to take him if she paid his $600 fee. Lenny in the auction yard. When Jessie Mazzoni, wife of Land Rover U.S. Eventing Team show jumping coach Silvio Mazzoni, saw her friend’s post about Lenny, she jumped at the chance to give Lenny a new life at their show jumping facility Senmila Farm in Ocala, Fla., as her 2-year-old daughter Mila’s future pony. Martin and Jessie began making arrangements to buy Lenny, all while Martin was still in her business meeting. “I’m sneaking out of this meeting and running to the bathroom with my cell phone, and I must’ve done this 10 times. I don’t know what they were thinking was happening!” said Martin. The women didn’t know much about the 13.2-hand pony, who was described as a POA though he didn’t come with any papers. The auction listing said that he was formerly a barrel racing and games mount and had done some farm work. Jessie estimates he’s around 11. Jennifer Taylor Williams, another friend of Martin’s who runs Bluebonnet Equine Humane Society near where Lenny was being held in Texas, volunteered to pick him up and keep him for a few weeks before he shipped to Florida. Friends also offered to cover transportation costs and veterinary bills. “Our friends were so wonderful,” said Martin. “People from all walks of life just jumped in and helped, whether it was with money or with time and effort to get him to a safer, happier place. It’s amazing how wonderful and giving people in the horse world can be. Now Lenny’s living the good life in a 20-acre field keeping Silvio’s yearling filly, Kimi, company. Lenny living the good life in his new home. 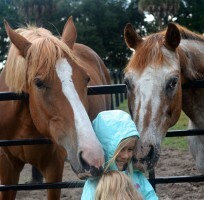 “It’s just funny—we have one little Appy pony in a barn full of jumpers!” said Jessie. “When he first came he was a little skittish; clearly he’d been manhandled for the last however many years, so he was a bit worried. We put him in a field with [Kimi], and he adores her. They are the cutest together. He’s actually really protective of her; it’s very sweet. This article appears in our June 8 issue of The Chronicle of the Horse.